Limited capacity? All this for only $162,000! This is the first property that PROPERTYOLOGY has purchased for our Singapore based client Neil. Neil, who had seen his previous DIY investment purchase in regional Victoria perform below expectations, began doing a lot of ‘reading’ about property investing, the do’s and don’ts as well as the where and where not’s. Eventually, whilst he was confident (thanks to quite a lot of positive media commentary at the moment) that Brisbane was the place to invest, he still felt given his limited knowledge of the market and the fact that he was living overseas, that he required professional assistance in selecting the right property, negotiating the lowest purchase price and assisting with all things due diligence. Through several discussions with our Senior Buyers Agent Bryan Loughnan, it became apparent that Neil, like many investors was looking to achieve long term capital growth through property investment. However, given his limited capacity, it was our professional opinion that Neil could do much better than limiting himself to Brisbane. Whilst Brisbane is our home town and the long term fundamentals are sound, increasing supply and a recent significant increase buyer activity (predominantly interstate investors) has seen vacancy rates increase and rental yields continue to decrease. Neither of which are ideal for an investor with such limited capacity. This basic 2 bedroom, 1 bathroom apartment may not be the ‘prettiest’ property ever purchased, but it is located minutes from major employment nodes, shops, cafes and the beach. 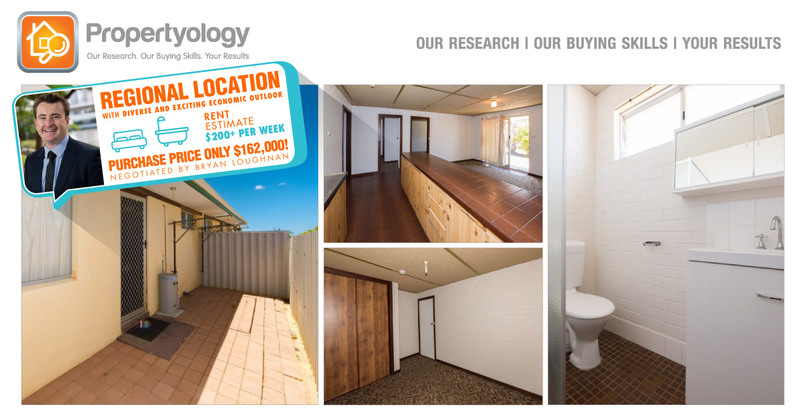 Situated on a quiet street in a location which has a strong employment and economic outlook as well as an apartment vacancy rate of less than 2%, this property will be highly sought after by tenants and future owners alike for many years to come. All of this for only $162,000!! With settlement having recently occurred, Neil is now working with his Property Manager to have a VERY basic face lift of the property completed. For less than $5,000, Neil and the Property Manager are expecting to complete internal painting, new curtains and installation of air conditioning and ceiling fans throughout. Upon completion, the property is estimated to rent for more than $200 per week. Nearly a 6.25% rental yield! A fantastic outcome and certainly one that when coupled with such a positive long term capital growth outlook for this particular location, Neil would not have been able to achieve in a location such as Brisbane. Congratulations again Neil from the entire PROPERTYOLOGY team.